Defensins are abundant and widely distributed peptides in human and animal tissues that are involved in host defence. Defensins not only have the ability to strengthen the innate immune system but can also enhance the adaptive immune system by chemotaxis of monocytes, T-lymphocytes, dendritic cells and mast cells to the infection site. Defensins also improves the capacity of macrophage phagocytosis. A greater understanding of how these peptides act in the healthy, gingivitis and periodontitis conditions would definitely open new opportunities for identification, prevention and treatment of periodontal diseases. This discussion focuses on recent studies about biological function of defensins in human diseases and animal models. Context: Atherosclerosis affects large and medium caliber arteries by forming calcific atheromas, precursors of cerebral vascular disease. Diabetes mellitus, obesity, and hypertension are considered as risk factors of atherosclerosis. Panoramic radiographs can display images suggestive of carotid artery calcifications (CACs). Aims: To investigate the prevalence of images suggestive of CAC in panoramic radiographs of the jaws (PRJs) and confirm them by Doppler ultrasonography. To evaluate their anatomic locations and relationships between systemic conditions (diabetes, hypertension, and obesity) and the presence of unilateral or bilateral CAC detected on PRJ or by Doppler ultrasonography. Materials and Methods: Of the 723 routinely performed PRJ in patients over 40 years at the Radiology Center in São Luís, Maranhão, Brazil, 21 PRJ containing images suggestive of CAC were selected in this cross-sectional study. The findings from the PRJ were confirmed by Doppler sonography. Results: Images suggestive of CAC was detected in 21 (2.9%) of the PRJ evaluated, consisting of 11 (52.4%) hypertensive, 7 (33.3%) diabetics, and 9 (42.9%) obese. There was a higher prevalence of hypertensive patients in the unilateral CAC group (100%) and bilateral CAC (60%) compared to patients without CAC (25%). Conclusions: CACs can be detected in PRJs, and are more frequent in common carotid arteries. No significant associations were detected between the presence of unilateral or bilateral CAC in PRJ and hypertension, diabetes, or obesity. Background: The objective of the study was to clinically evaluate age-related - oral manifestations and co-morbidities in different age groups of human immunodeficiency virus-infected/acquired immune deficiency syndrome adults. Materials and Methods: A cross-sectional study was conducted among 200 adult patients aged above 20 years at infectious diseases units, medical wards and ART centre of Gandhi Medical Hospital, Hyderabad. Oral manifestations were diagnosed according to the presumptive criteria of EC-Clearinghouse Classification, and clinical data were retrieved from patient's medical records. Chi-square test was used for statistical analysis. Results: Men (72%) in the young age group of 21–30 years were commonly affected. Heterosexual mode of transmission was most common in all the age groups, and the overall distribution were statistically significant (P < 0.05). Most common oral findings seen in 21–30 years of age were depapillation (90%), hyperpigmentation (70% and 72%) in 31-40 and 41–50 years old and linear gingival erythema (68%) in above 50 years of age group. The various co-morbidities included the recurrent bacterial and skin infections (64% and 62% respectively) in the younger age group. Renal and cardiac diseases with pulmonary tuberculosis (74%) were commonly observed in middle-aged and elders. Conclusions: The underlying oral manifestations and co-morbidities could become very important variables that must be taken into account in determining treatment efficacy or health policy. Context: Traumatic dental injury and malocclusion constitute a public health problem due to their high prevalence. Preventing or detecting such conditions, in any population, is of paramount importance. Aim: Assessing the association of anterior occlusal characteristics and dental trauma in preschool children. Settings and Design: A cross-sectional study was carried out with 2–6-year-old randomly selected by a sample calculation, resulting in 606 subjects Materials and Methods: A questionnaire to collect information about the sample (age, gender, and race) was sent to the children's parents. Two trained and calibrated examiners (Kappa 0.80) evaluated dental trauma according to criteria established by the World Health Organization. The following anterior occlusal characteristics were evaluated: Normal occlusion, anterior open bite, anterior crossbite, increased overjet (categorized as ≥3 mm), and increased overbite (categorized as ≥3 mm). Statistical Analysis Used: The variables associations were assessed (odds ratio, Chi-square test, and logistic regression, P < 0.05) using statistical software (SPSS, version 16.0). 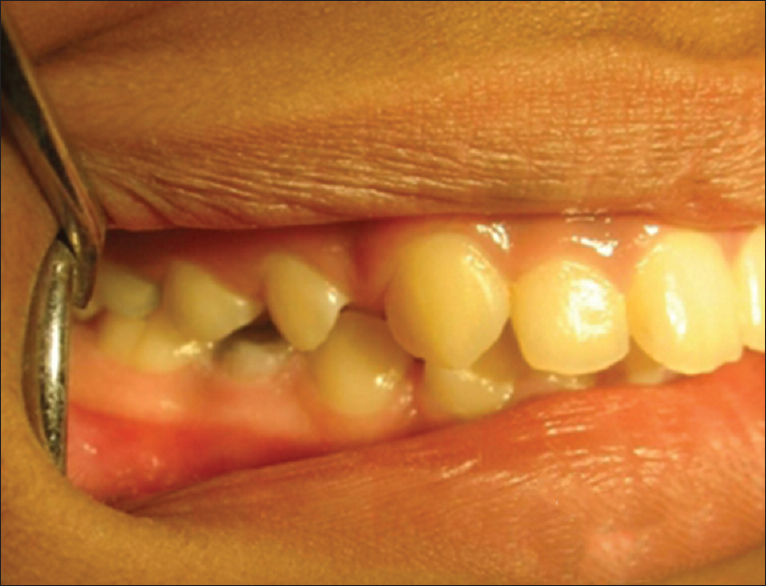 Results: Dental trauma was observed in 20.8% and malocclusion in 48.6% of the children. There is an association between malocclusion and dental trauma (P = 0.01). Children with malocclusion have a 64% higher chance of suffering dental trauma. 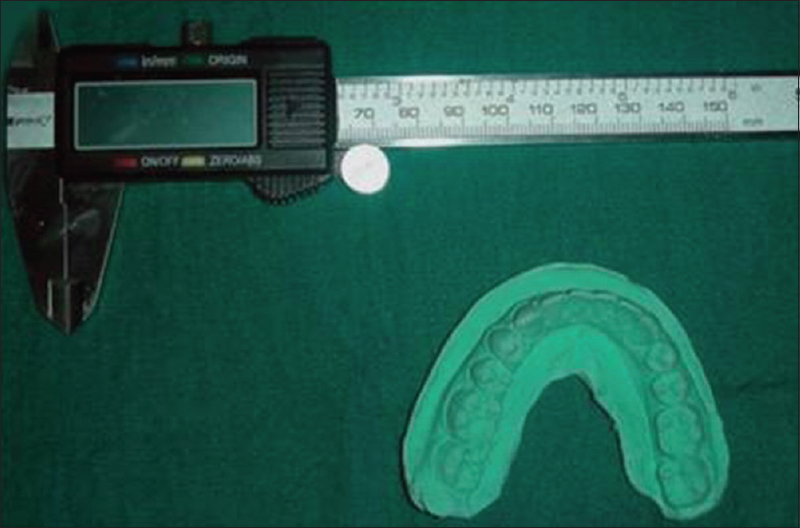 Increased overjet was the type of malocclusion related to a higher rate of tooth fracture (P < 0.01). Subjects with this type of malocclusion suffered tooth fractures three times more often than subjects with other malocclusion types. Conclusions: There was association of dental trauma and malocclusion. 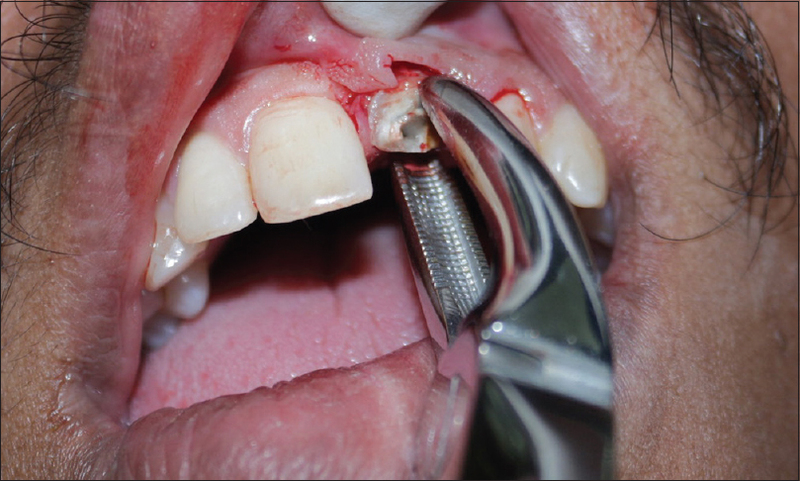 Increased overjet was the most common malocclusion related to dental trauma. Preventive strategies are needed to reduce the rate of anterior malocclusion and, consequently, dental trauma in preschool children. Aims: The frequency, with which restricted mouth opening is encountered in the clinical practice, makes it essential to establish what constitutes the normal range. This study was undertaken to evaluate the normal range of mouth opening in adult population in south India. Settings and Design: randomized clinical study conducted on dentate adult patients to evaluate the normal range of mouth openin. Materials and Methods: 500 healthy patients aged between 18-59 were randomly selected and divided into four groups according to their age ranges. The maximum inter-incisal distance and width of right and left three fingers at the first distal inter-phalanges were measured using vernier calipers. Statistical analysis used: ANOVA test, student t test and pearsons correlation test. Results: The mean value and range of maximum mouth opening of 50.3mm±6.26mm for males and 49.9mm±6.74mm for females was recorded. These values were significant and correlated with the width of three fingers. It was found that the greatest mean maximum mouth opening was recorded in youngest age group and lowest was recorded in older age group in both genders. Conclusions: The mean mouth opening value decreases with age and is lesser in females as compared to males of same age. This study demonstrated that individuals in all the four groups were able to vertically align their right and left three fingers between the upper and lower central incisors upto the first distal interphalangeal folds thus suggesting that, width of three fingers can be used as 'tool' to distinguish 'normal' from 'restricted' mouth opening. Context: Many synthetic bone materials have been introduced for repairing bone defects. Aim: The aim of this study is to comparatively evaluate the efficacy of nano-hydroxyapatite (HA) and nano-bioglass bone materials with their traditional micro counterparts in repairing bone defects. Materials and Methods: In this prospective animal study, four healthy dogs were included. First to fourth premolars were extracted in each quadrant and five cavities in each quadrant were created using trephine. Sixteen cavities in each dog were filled by HA, nano-HA, bioglass, and nano-bioglass and four defects were left as the control group. All defects were covered by a nonrestorable membrane. Dogs were sacrificed after 15, 30, 45, and 60 days sequentially. All 20 samples were extracted by trephine #8 with a sufficient amount of surrounding bone. 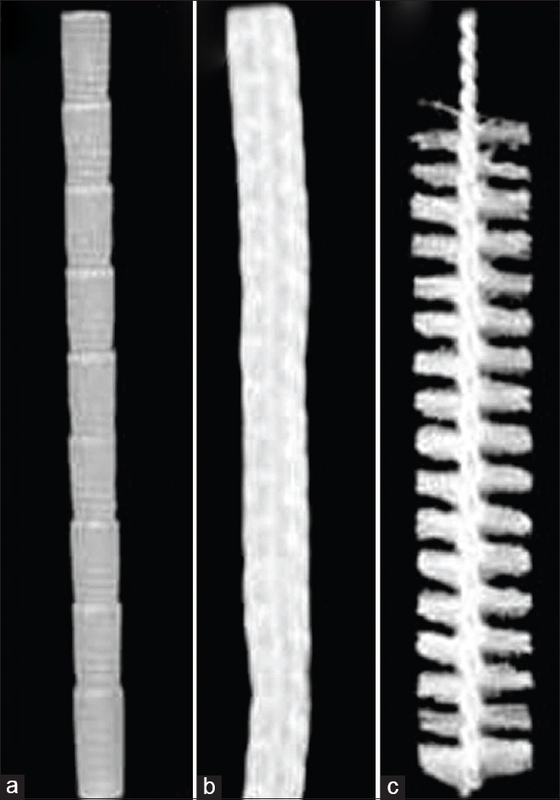 All specimens were investigated under an optical microscope and the percentage of total regenerated bone, lamellar, and woven bone were evaluated. Statistical Analysis Used: Data analysis was carried out by SPSS Software ver. 15 and Mann–Whitney U-test (α =0.05). Results: After 15 days, the bone formation percentage showed a significant difference between HA and nano-HA and between HA and bioglass (P < 0.001). The nano-HA group showed the highest rate of bone formation after 15 days. Nano-bioglass and bioglass and nano-HA and nano-bioglass groups represented a significant difference and nano-bioglass showed the highest rate of bone formation after 30 days (P = 0.01). After 45 days, the bone formation percentage showed a significant difference between nano-bioglass and bioglass and between nano-HA and nano-bioglass groups (P = 0.01). Conclusions: Nano-HA and nano-bioglass biomaterials showed promising results when compared to conventional micro-particles in the repair of bone defects. Aim: To evaluate and compare the effect of flapless and “open flap” techniques of implant placement on crestal bone height (CBH) around implants. 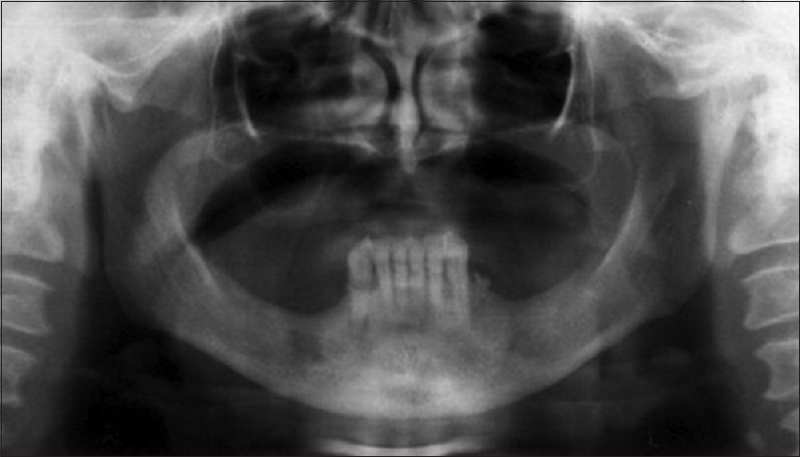 Materials and Methods: This prospective study comprised of 32 implants placed in 16 subjects with a bilateral missing mandibular first molar. In each subject, one implant was placed with “flapless” and other using “open flap” technique. Radiographic assessment of CBH was carried out using standardized intraoral periapical radiograph of the site at baseline, 3 months, 9 months and 15 months after implant placement. Statistical Analysis: Data were analyzed using STATA 11.0 statistical software. To determine the changes in CBH from baseline, at 3-, 9-, and 15-month, repeated measures analysis of variance followed by post-hoc Bonferroni was used for each of the two techniques for mesial and distal aspects separately. For both techniques, changes in CBH from baseline to 15 months were compared using an independent t-test with a confidence interval of 95%. Results: For “flapless” technique, there was no statistically significant (P > 0.05) reduction of CBH in initial 9 months but was significant for the 9–15 months period while for “open flap” technique, statistically significant (P < 0.05) reduction was observed up to 15 months. Comparison of both techniques showed significantly lesser reduction with “flapless” than “open flap” technique. The overall average crestal bone loss was 0.046 ± 0.008 mm on mesial aspect, 0.043 ± 0.012 mm on distal aspect with “flapless” technique and 1.48 ± 0.085 mm on mesial aspect, 1.42 ± 0.077 on distal aspect “open flap” technique. Conclusions: Both techniques showed a reduction in CBH with time but the flapless technique showed a lesser reduction. Therefore, the flapless technique can be considered as a better treatment approach for placement of implants, especially where adequate width and height of available bone are present. Aim: To evaluate the changes in surface topography and roughness of stainless steel (SS), nickel-titanium and beta-titanium (β-Ti) archwires after clinical use and sterilization. Settings and Design: Thirty wires each of SS, nitinol, and β-Ti (3M Unitek) were tested in as received, as received and autoclaved, and clinically retrieved then autoclaved conditions. Materials and Methods: A sterilization protocol of 134°C for 18 min was performed using an autoclave. Surface topography of specimens from each subgroup was examined using an environmental scanning electron microscope (ESEM model Quanta 200, The Netherlands) at ×100, ×1000, and ×2500 magnifications. Surface roughness was measured using arithmetic mean roughness (Ra) values obtained from optical profilometric scanning (Taylor Hobson, Leicester, UK). Statistical Analysis: Data were analyzed by one-way analysis of variance and Tukey's post-hoc procedures. Results: Scanning electron microscope images revealed an increase in surface irregularities in SS and nitinol wires after clinical use. There was a significant increase in Ra values of SS orthodontic wires after intra-oral exposure (P = 0.0002). 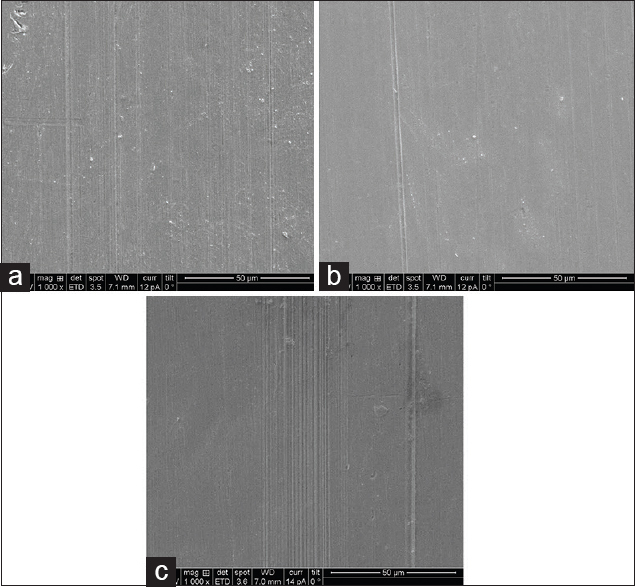 Conclusion: Surface roughness of SS wires increased significantly after clinical use. Autoclave sterilization did not affect considerably on surface characteristics of any archwire. 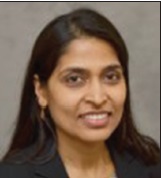 Objective: The objective of the study was to compare the clinical efficacy of use of a diode laser (DL) (810 nm) as an adjunct to modified Widman flap (MWF) surgery to that of MWF alone. Materials and Methods: Twenty-five patients between the ages of 20 and 50 years with generalized chronic periodontitis were selected for the study. Control sites (Group A) were randomly selected to receive an MWF, and the contralateral test sites (Group B) received MWF in conjunction with low-level laser therapy. The energy density of 4 J/cm 2 was applied to the gingival surface after periodontal treatment. The study tooth/site was treated along with any additional teeth in the quadrant in which the site was located if needed. Randomization was done using a coin flip. The DL was used to de-epithelialize the inner part of the periodontal flap and photo-biostimulate the surgical area. Plaque index (PI), papillary bleeding index (PBI), probing depth (PD), and clinical attachment level (CAL) scores were recorded at baseline and at 6 and 9 months. Statistical Analysis: Data were expressed as the mean ± standard deviation. Statistical analyzes were performed using paired Student's t-testfor intragroup comparisons and unpaired Student's t-test for intergroup comparisons.Results: No significant difference was observed in PI scores between the two groups at baseline, 6 and 9 months. PBI scores were significantly lower in Group B versus Group A at 6 months (P < 0.01). However, no significant difference was observed between the two groups in PBI scores at the end of 9 months. PD reduction in Group B versus Group A was statistically significant at the end of 9 months (P < 0.01). Gains in CAL were significantly greater in Group B versus Group A at 6 and 9 months. Conclusion: The use of an 810 nm DL provided additional benefits to MWF surgery in terms of clinical parameters. Context: Despite the advances in orthodontic material and treatment mechanics, the placement of fixed appliances increases the risk of enamel demineralization. The development of fluoride release adhesives has attracted considerable interests because the combined use of antimicrobials and fluoride enhances the cariostatic effect. Aim: To compare the shear bond strength (SBS) of fluoride release adhesives with established orthodontic adhesives and assess failure mode using adhesive remnant index (ARI). 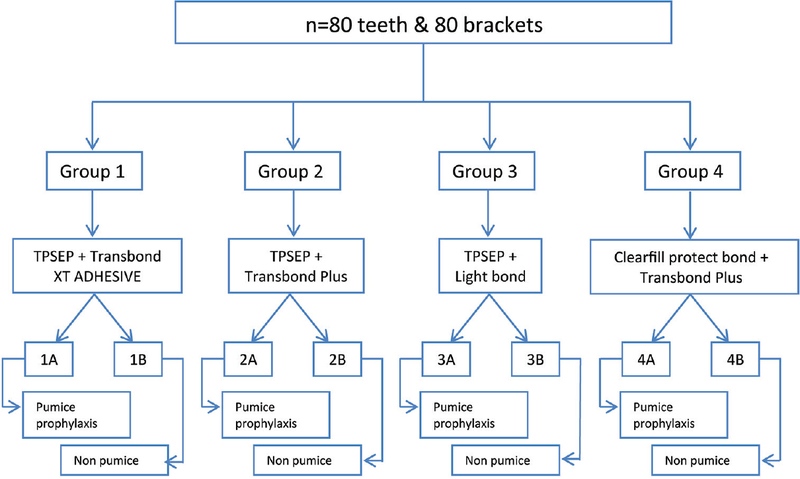 Settings and Design: The present study included 80 maxillary premolars which were randomly divided into four groups (n = 20) and were further subdivided into two subgroups A - Pumice prophylaxis (PP) and subgroup B - No PP (n = 10). Materials and Methods: Stainless steel brackets were bonded with Transbond XT, Transbond plus (TP) color change adhesive, Light Bond, and Clearfil protect bond. After debonding, the ARI was used to assess the mode of bracket failure. Statistical Analysis: The data were analyzed using two-way analysis of variance, Post-hoc Tukey Honest significant differences test, and Chi-square test. Results: The mean SBS of Group 4 was comparably higher regardless of PP. Brackets bonded with TP showed a comparable SBS to conventional Transbond XT. The ARI scores were predominately 2. Conclusions: Fluoride releasing adhesives combined with antibacterial monomer can play a vital role in reducing white spot lesions by enhancing the cariostatic effect especially in noncompliant\medically compromised patients. Context: Various methods are used for gender identification in anthropologic and forensic investigations. The canine tooth is widely used for gender determination because of its sexual dimorphism and durability in the oral cavity. Mandibular canine index (MCI) is one of the most reliable and valid predictor for gender identification. Aim: To assess the reliability of MCI in gender determination in Indian population. Settings and Design: This was an experimental study involving the preparation of plaster models of 100 individuals residing in Udaipur, Rajasthan, India. Of these 45 were males and 55 were females. Both sexes were in the age group of 20–30 years. Study casts were prepared for all individuals and the measurements of mandibular canine teeth were taken. The MCI was calculated using standardized equation. In addition, the percentage of sexual dimorphism was calculated. Statistical Analysis Used: Independent sample t-test was used. P < 0.05 was considered statistically significant. Results: There was a significant difference (P < 0.05) observed between inter-canine distance, right and left canine width and right and left MCI between males and females. Sexual dimorphism is more on left permanent mandibular canine teeth than right permanent mandibular canine teeth. The overall percentage of accuracy observed was 85.5%. Conclusions: Study findings reveal that MCI can be used a reliable predictor for gender determination in Indian population and can form the basis of anthropologic and forensic investigations. Background: Polyfiber posts used inside the root canal can help to restore the fracture resistance of weakened premolars. Aim: To assess the fracture resistance of endodontically treated premolars restored with different techniques, including the new polyfiber post (Spirapost). Materials and Methods: One hundred superior premolars were distributed into 10 groups (n = 10): Sound teeth (G1-positive control) and experimental (G2 to G10), which received MODP cavities and canal treatment. Groups were restored as follows: G2 - unrestored (negative control); G3 - microhybrid resin (MR); G4 - flowable resin (FR) + (MR); G5 - glass fiber post (Reforpost) + MR; G6 - Reforpost + FR + MR; G7 - polyethylene fiber (Ribbond) + MR; G8 - Ribbond + FR + MR; G9 - polyfiber post (Spirapost) + MR and G10 - Spirapost + FR + MR. After 24 h, the specimens were loaded until fracture. Data were analyzed by ANOVA and Tukey's test (P < 0.05). Results: Premolars restored with Spirapost (G9 and G10) provided the highest fracture strength (P < 0.05), similar to sound teeth (G1), regardless of the composite resin. Intermediate values were achieved by G3, G4, G5, G6, G7, and G8, which were similar (P > 0.05) and different from the others (P < 0.05). Inferior values were found in G2 (P < 0.05). Conclusion: Fracture resistance of premolars with MODP cavities and endodontic access was recovered with the direct rehabilitation with Spirapost, regardless of the type of composite resin. Aims: The aim of this study was to evaluate the number of intracanal bacteria extruded apically during root canal preparation using rotary ProTaper, K3XF, twisted, and hand K-file system. Subjects and Methods: Seventy extracted single-rooted human mandibular premolar teeth were used. Access cavities were prepared and the teeth were mounted in glass vials. Root canals were then contaminated with a pure culture of Enterococcus faecalis (ATCC 29212) and incubated at 37°C for 24 h. The contaminated roots were divided into four experimental groups of 15 teeth each and one control group of 10 teeth. Group 1: ProTaper; Group 2: K3XF; Group 3: Twisted file; Group 4: Hand K-file; Group 5: Control group. 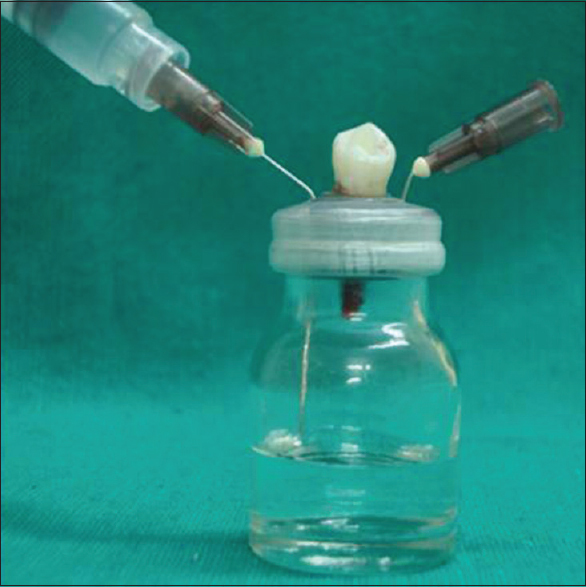 Bacteria extruded from the apical foramen during instrumentation were collected into vials. The microbiological samples were incubated in culture media for 24 h. Colonies of bacteria were counted and the results were given as number of colony-forming units (CFU)/ml. Statistical Analysis Used: The obtained data were analyzed using the Kruskal–Wallis one-way analysis of variance and Mann–Whitney U-tests. Results: There was a significant difference between the rotary and hand instrumentation system related to the apically extruded intracanal bacteria. Conclusions: Both the rotary and hand instrumentation systems extruded intracanal bacteria through the apical foramen. K3XF file system showed least bacterial extrusion amongst all instrumentation groups. Context: Recycling of orthodontic brackets in developing orthodontic economies is an extremely common procedure. Bonding protocols and reliability of these brackets is, however, questionable, and still the subject of research. Aims: The aim was to evaluate and compare the shear bond strength of brackets recycled with sandblasting and silicoating. Materials and Methods: Ninety extracted human premolars were bonded with 0.022” SS brackets (American Orthodontics, Sheboygan USA) and then debonded. The debonded brackets were divided into three groups of 30 each. Group I: Sandblasting with 50-μm aluminum oxide (control group) Group II: Sandblasting with 50-μm aluminum oxide followed by metal primer application Group III: Silicoating with 30-μm Cojet sand followed by silane application and rebonded with Transbond XT. The sandblasted brackets and silicoated brackets were viewed under the scanning electron microscope, immediately after surface conditioning before rebonding. The shear bond strength with each group was tested. Statistical Analysis Used: One-way analysis of variance, post-hoc Scheffe multiple comparison tests. Results: The results showed that sandblasting created more irregularities and deeper erosions while silica coating created superficial irregularities and shallow erosions. Aim: This study aimed to evaluate the effect of sodium hypochlorite (NaOCl) pretreatment on bond strength of adhesive systems to different dentin regions. Materials and Methods: Forty human molars were randomly assigned according to different adhesive systems (Adper Single Bond 2; Clearfil SE Bond; Adper SE Plus; G-Bond), pretreatments (control and NaOCl - deproteinization) and dentin regions (proximal, superficial occlusal [SO] and deep occlusal [DO]), n = 5. 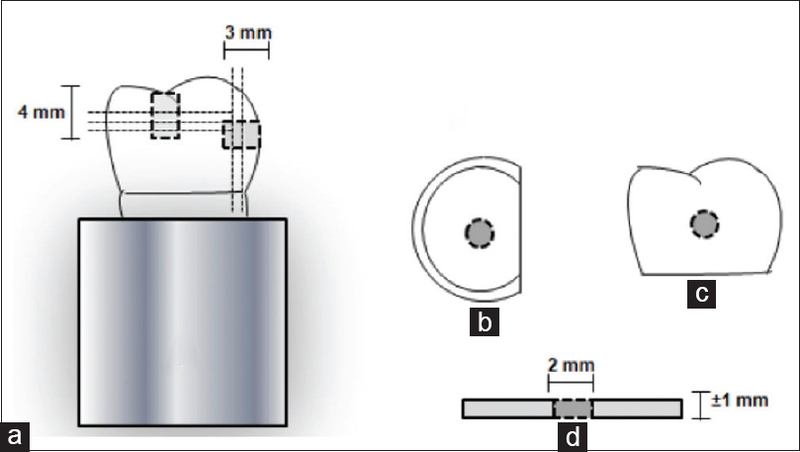 Cylindrical cavities were performed at the proximal and occlusal surfaces of each sample. For deproteinization, 10% NaOCl was applied on conditioned dentin for 60 s before the adhesive systems application. Two occlusal and one proximal slice were obtained from each sample and submitted to the push-out test. The mode of fracture was analyzed. The data were subjected to three-way ANOVA and Tukey test (P < 0.05). Results: There was statistically significant difference between the adhesive systems (P < 0.01) and dentin regions (P < 0.01); however, the pretreatment did not significantly affect the bond strength values (P > 0.05). The bond strength values were higher for the proximal surface, followed by SO and later by DO, being influenced by the adhesive system. The two-step self-etch adhesive systems presented the highest bond strength results. Conclusion: The deproteinization pretreatment showed similar bonding effectiveness to the conventional adhesive technique. The dentin region plays a rule on the bond strength values. Background: Dental implants (DI) are emerging as an alternative to dentures. Immediate placement of DI for esthetic concern has been always in demand. This is a retrospective analysis of the success rate of immediately placed DI in freshly extracted single-rooted tooth socket, by clinical, radiographical, soft and hard tissue changes in a follow-up period of 1 year. Materials and Methods: Retrospective analysis of all cases of immediate DI placed in the single rooted socket was performed. Cases were selected based on previously established inclusion and exclusion criteria. Age, gender, tooth, jaw, cause of impending tooth loss, tooth diameter along the cervical margin, the width of keratinized gingiva (WKG), and radiographic measures were performed for up to a year. Descriptive statistics and comparison of means were presented. P < 0.05 was taken as significant. Results: Of the 324 immediate DI placed in 207 patients during the study period, 61 fulfilled the criteria. There were 49.2% males 31.15% had dental caries, 61% involving maxilla. The mean age of patients was 34.82 ± 7.97 years. Mean extraction socket diameter was 4.6 ± 1.78 mm. From complete stability of DI, the WKG decreased from baseline to 3 months period and regained at 12-month follow-up. The difference was statistically significant (P = 0.01). The same trend was noticed in the distance of the mesial and distal papilla as measured in the probe (P = 0.075). Radiographical changes also reflected a similar trend. 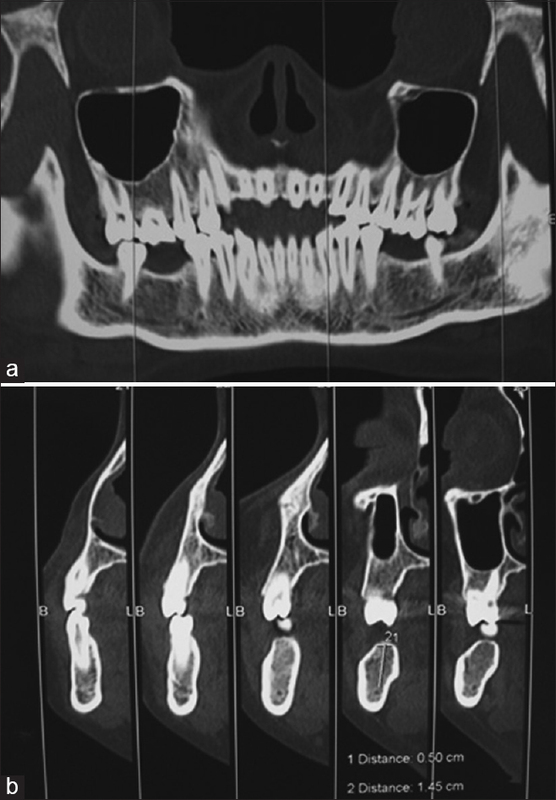 Discussion: The success of DI, in terms of clinical and radiographical parameters, in an immediate DI placed in a single rooted fresh extracted socket, gives adequate clinical results. Context: There is a need to evaluate the quality of postgraduate dissertations of dentistry submitted to university in the light of the international standards of reporting. Aims: We conducted the review with an objective to document the use of sampling methods, measurement standardization, blinding, methods to eliminate bias, appropriate use of statistical tests, appropriate use of data presentation in postgraduate dental research and suggest and recommend modifications. Settings and Design: The public access database of the dissertations from Rajiv Gandhi University of Health Sciences was reviewed. Subjects and Methods: Three hundred and thirty-three eligible dissertations underwent preliminary evaluation followed by detailed evaluation of 10% of randomly selected dissertations. The dissertations were assessed based on international reporting guidelines such as strengthening the reporting of observational studies in epidemiology (STROBE), consolidated standards of reporting trials (CONSORT), and other scholarly resources. Statistical Analysis Used: The data were compiled using MS Excel and SPSS 10.0. Numbers and percentages were used for describing the data. Results: The “in vitro” studies were the most common type of research (39%), followed by observational (32%) and experimental studies (29%). The disciplines conservative dentistry (92%) and prosthodontics (75%) reported high numbers of in vitro research. Disciplines oral surgery (80%) and periodontics (67%) had conducted experimental studies as a major share of their research. Lacunae in the studies included observational studies not following random sampling (70%), experimental studies not following random allocation (75%), not mentioning about blinding, confounding variables and calibrations in measurements, misrepresenting the data by inappropriate data presentation, errors in reporting probability values and not reporting confidence intervals. Few studies showed grossly inappropriate choice of statistical tests and many studies needed additional tests. Conclusions: Overall observations indicated the need to comply with standard guidelines of reporting research. Stainless steel crowns (SSC) are extensively used in child patients. They are mainly used following the pulp therapy in deciduous teeth. They are also used in multi-surface restoration, as an abutment in space maintainers, correction of anterior tooth cross bite, restoration of hypoplasic teeth, etc. In permanent teeth, they are mainly used as interim restorations following root canal treatment in first molars prior to the eruption of permanent second molars. The main advantage of SSC is its limited chair side time, durability and ease of placement. Patients with conditions such as pregnancy and old age who cannot tolerate multiple and long appointments can greatly benefit from the use of SSC. Though SSC can be used by other dental specialties very effectively, its use seems to be limited to pediatric dentistry. Presented here are few adult cases in which SSC is given with good success. Periodontal disease results from inflammation of the supporting structure of the teeth and in response to chronic infection caused by various periodontopathic bacteria. The mechanical removal of this biofilm and adjunctive use of antibacterial disinfectants and antibiotics have been the conventional methods of periodontal therapy. However, the removal of plaque and the reduction in the number of infectious organisms can be impaired in sites with difficult access. 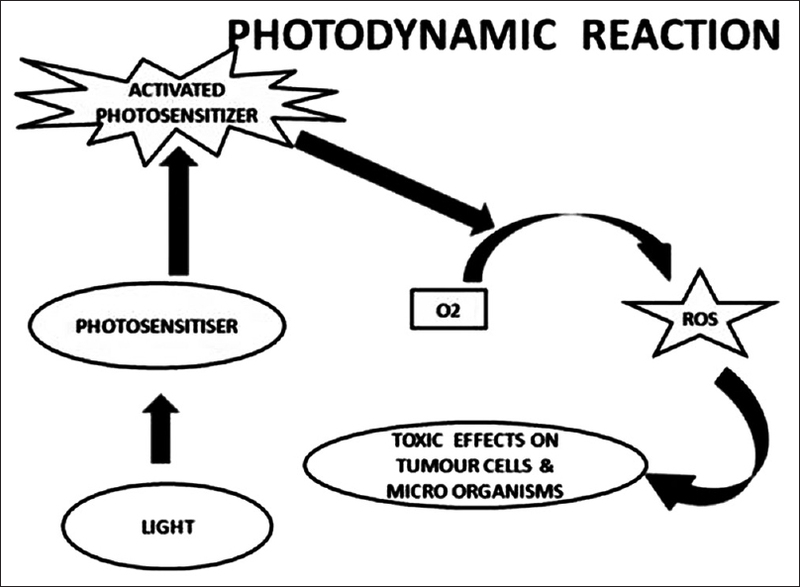 Photodynamic therapy (PDT) is a powerful laser-initiated photochemical reaction, involving the use of a photoactive dye (photosensitizer) activated by light of a specific wavelength in the presence of oxygen. Application of PDT in periodontics such as pocket debridement, gingivitis, and aggressive periodontitis continue to evolve into a mature clinical treatment modality and is considered as a promising novel approach for eradicating pathogenic bacteria in periodontitis.